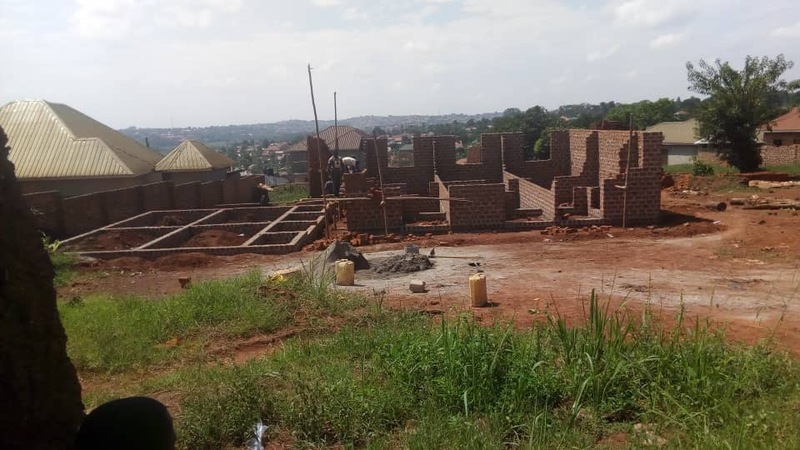 On May 2, 2018 we completed the purchase of a 100ft x 50ft piece of land in Namugongo, Kyadondo (approx. 1.5 km from Gayaza trading centre) for the price of 9000 CAD. Following many months of finalizing architectural plans and obtaining the licences and permits necessary to begin building, on August 13, 2018 we broke ground and completed the foundational work for all the buildings. During the months of September and October we completed the construction of both housing buildings (save for the roof). January and February, 2019 brought with it an influx of incredible donations for generous donors. This has allowed us to move forward with putting roofs on the houses as well as to begin the construction of the training facility and the office building! THANK YOU to all of our supporters! We are so excited to share this project with you as it continues to progress and the women/families MOVE IN!!!! The new property has housing enough for five families along with private latrines and shower rooms for each family and an outdoor cooking area for charcoal cooking stoves. There will also be a training facility and office building separate from the housing complexes. The community of Namavundu is made up of families from a wide range of economic backgrounds. Many survive on minimal wages, making just enough to provide the basic necessities for their families. However, there are also those that do not even achieve this level of provision. Over the past four years we have met families, all headed by single women, that live on less than $10 per month. With the average cost for house/room rentals at $20-$50/month, even providing shelter for their families becomes almost impossible. With all of their money being used for rent, there is essentially nothing left to buy food for their families, or to pay for medical bills if one of their children becomes sick. For these families education is a luxury that often is not within their grasp unless they have received child sponsorship through Bridging Villages, to assist with paying of their fees. Our goal for this project is to use our new property to provide free housing for five different families in the coImmunity for eighteen months. During this time the women will receive skills training in EQUAL EMPLOYMENT training. In these communities women who have not completed secondary school are historically only permitted to learn specific skills (tailoring, weaving, baking, digging, cleaning), however, men with the same level of education receive training in many different trades (carpentry, mechanics, welding, electrical). These trades have the potential to earn far higher wages than the skills provided to the women. We believe that women should have the same opportunities to learn this trades and have the chance to provide financial stability for their families. Following successful completion of their training the women will be eligible to receive a small business loan in order to grow their own business/trade and attain longterm financial security. Once the women have completed the program we will assist them in finding affordable housing for their families so they can begin their independent lives. October 31, 2018 The family homes are ready to have roofs added and we are starting to lay the foundation for the office and training facility buildings. If you would like to donate towards the purchase and renovation of this property please do so by clicking the "Donate" link below. We will work to provide as much financial assistance over the first 18 months for these families. This will allow the women to fully commit to their training without the pressure of working long hours for minimal wages in an effort to provide for their children. This support will be accomplished through short-term sponsorships for each family. The funds from these monthly donations will be used to purchase food and clothing for the families as well as medical care when needed.